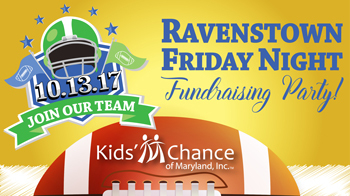 Kids’ Chance of Maryland, Inc. Ravenstown Friday Night Fundraising Party! October 13, 2017 from 6:30 p.m. – 10:00 p.m.
Kids’ Chance team supporters will have the chance to meet & greet Baltimore Ravens’ Defensive Tackle Brandon Williams and get their photo taken with him! Everyone will receive a memento from the event. Semmes is a frequent and proud sponsor of Kids’ Chance events. They help raise scholarship money for the children of Maryland workers fatally or catastrophically injured in work-related accidents. Semmes Principal Rudy Rose serves on the Board of Directors. To purchase tickets, email info@kidschance-md.org or call 410-832-4702. To find out how else you can help, visit http://www.kidschance-md.org. The 2019 edition of The Best Lawyers in America © includes nine Semmes attorneys.